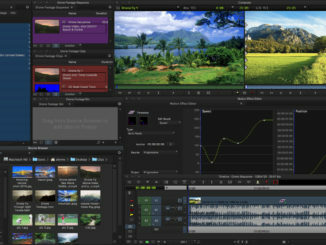 Since Blackmagic had already announced their new URSA MINI PRO G2 last month at their virtual press conference, today’s NAB Presser had a lot to do with all the new features coming to DaVinci Resolve 16, including a new smart editing page which is designed to streamline your workflow and eliminate wasted effort. But Grant Petty and Team BMD also showed off some new hardware for moving into the 8K ecosystem, and in a big way. 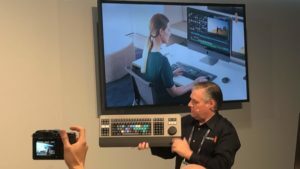 First out the gate, BMD CEO Grant Petty showed off the Blackmagic Hyperdeck Extreme 8K HDR Recorder. Capable of recording 8K video in HDR, the Hyperdeck Extreme has a standard touchscreen interface, broadcast controls, Quadlink 12G SDI in/out, SDI, and Ethernet. It records HDR 8K video to CFast cards, with dual bays so users can hot swap and continue to record without losing a frame of footage. 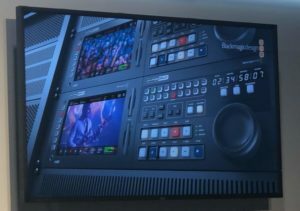 Petty also pointed out that while the Hyperdeck is shown in a rack configuration, it is also capable of functioning as an 8K field recorder. 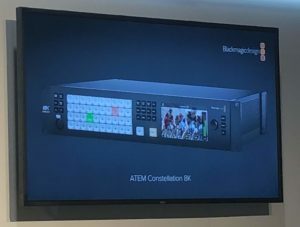 Next up was the Blackmagic ATEM Constellation 8K Switcher, which comes with a massive 40 inputs and 24 outputs. 2 NADI outputs and a 156 channel audio mixer. 4 multiview outputs can be driven to a single monitor, with each multiview dividing up into quadrants. The result is a maximum 16 different inputs into a single screen, making it ideal for a virtual broadcast studio. The ATEM also comes with dual audio talkback loops, one for production and one for engineering. Next up was the Teranex Mini 8K SDI t0 HDMI switcher, which offers 2 independent on screen scopes for adjusting the luminance and chrominance, plus third party monitor calibration that is powered by Blackmagic’s Camera OS. The calibrating utility can then build a lookup table that can be saved and shared with multiple cameras and monitors. A nifty option. $1295. 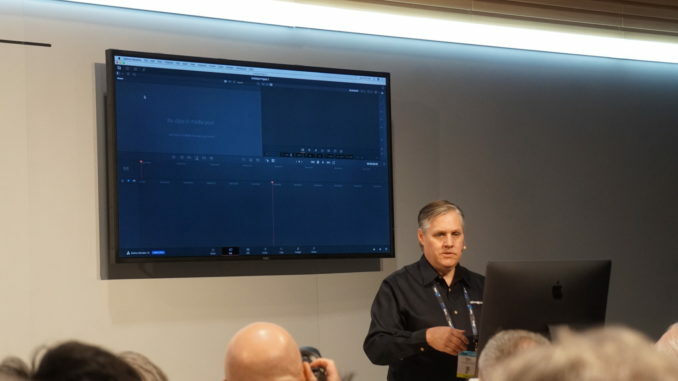 Petty then turned his attention to DaVinci Resolve 16, which is offering a host of new smart features built on the Blackmagic Neural Engine, which uses artificial intelligence to make your editing workflow a lot easier. 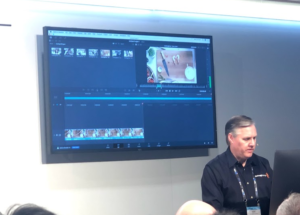 Explaining that the goal of Resolve is to minimize the wasted effort that happens in today’s modern NLE workflow, Petty said that Resolve 16 has been engineered to remove unnecessary effort, and to use AI to offer smart insertion edits. Petty then pointed to the dual timeline which offers a bird’s eye view of the timeline and a frame by frame timeline simultaneously. This way, users are taking the effort to zoom in and out of the timeline, especially when scratch trimming. In fact, users can edit from three different timelines, the main timeline, the assembly timeline, and then the scratch trim timeline for each clip. And all three will react with each other. Once you set and in point and out point into your scratch trim, the Neural Engine will then create a smart clip that is dropped right into the assembly edit. You can also mark the in point against the audio track and Resolve will drop in what you need right into the timeline with a smart insert feature that will know exactly where it needs to go without you having to set the edit point on the timeline to insert it. 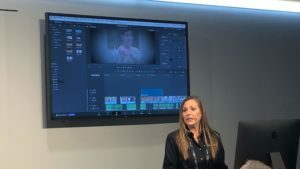 Petty also took a moment to talk about old school linear editing, and how you can switch to it in Resolve 16 thanks to their new Resolve Keyboard editor. An editing keyboard with mechanical keys, job wheel, timecode editing, a ’00’ key and transition controls. “The benefit here is that you’re using both hands,” Petty added. “Now you can do an edit in seconds, or minutes.” The editing keyboard is $995 and will be available in August. Petty also took a moment to let one of his other team members show off some other great Resolve features, including “Smart Bins,” which enables editors to organize their bins according to character using facial recognition. This enables for automatic population as new footage comes in, all organized according to the AI’s analysis of facial features. So you can keep all your character footage where it needs to be. Other features include GPU accelerated 3D scopes for color depth in the color grading page, auto balance and shot match for a quick color grade on the fly, when a new scene has to match the shots around it. Fairlight also gets some love with ADR and elastic wave adjustments which can make doing ADR a lot easier should your actor’s dubbing needs to be matched even closer in post. Fairlight also has new loudness meters that work according to regional requirements and are color coded to show you when your sound is clipping.Fusion has been dialed in to perform faster, and there’s even a special object removal feature that can mask and remove unwanted details in the scene, and then, using AI it can replace the pixels in that area with what’s around it. It’s very much like Adobe’s content aware fill for video. Finally, Petty returned to the stage to show off a new accessory for the phenomenally successful Pocket Cinema Camera 4K. 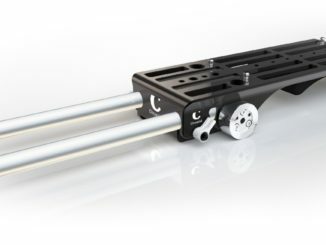 The chief beef has been that the BMPCC4K has poor battery life, and BMD has addressed that with a new battery grip, which houses two Sony NP4 batteries, which has a quick slide battery tray that can be hotswapped for hours of recording. The Grip will ship in August for $245, and I’m betting many new Pocket users will simply buy it when they get their camera. So while this year’s BMD Presser wasn’t as packed with announcements as in previous NAB years, I think the splash made by DaVinci, the Pocket battery Grip, and the new 8K workflow that Blackmagic is establishing is laying the ground work for the future. And I have a hunch we’ll see some exciting new cameras come in 2020 to take advantage of it.